This just tickled my fancy. A British nurse has been forced to take an English language test before she can work in Australia. The NSW Nurses and Midwives Board introduced new language proficiency regulations for all migrants on 1st January. This rule even applies to the 33 year-old Birmingham born, Bristol educated Ms Julie Dutton; despite her being fluent in English, and holding a Nursing degree from an English university. There is an undoubted need for a nurse to be able to communicate effectively with other hospital staff. But is this a case of “bureaucracy gone mad” as the NSW Opposition claim, or just a lack of commonsense? 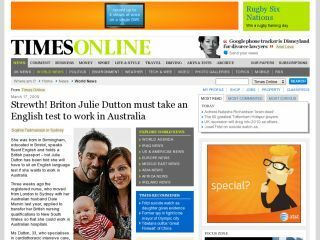 More frustrating was the fact that the next test that Ms Dutton could sit was in June. With government intervention, a place has been found this weekend at Macquarie University’s International English Language Testing System Centre. David Harris from the testing authority said “If it was to be decided that people should be exempted from the test, on the basis of what evidence would they make that decision?” That indeed is the question, the one that should have been determined prior to the regulation being introduced. Interestingly, it must be noted that Australian nurses in the UK face the same profiency requirements.